Sebastian Steudtner from Nuremberg, Germany is nominated for the Tag Heuer XXL Biggest Wave Award for this ride at Nazaré, Portugal on October 24, 2016. LOS ANGELES, CA/USA (Tuesday, March 28, 2017) – The list of nominees for the 2017 World Surf League (WSL) Big Wave Awards have been announced. With $350,000 in total prize money to be allotted across the seven categories and a TAG Heuer Watch for each winner, the Big Wave Awards will honor the best performances of the year, from tubes to wipeouts. Photographs and videos of all the nominated rides can be viewed at worldsurfleague.com/bigwave. Nominated rides come from every corner of the world, including California, Tasmania, Portugal, Hawaii, Mexico and Fiji. Shortlisted surfers range from established veterans such as the newly crowned Big Wave Tour Champions Grant Baker (ZAF) and Paige Alms (HAW) to younger rising stars like Lucas “Chumbo” Chianca (BRA), Trevor Sven Carlson (HAW) and Kai Lenny (HAW). Another obvious trend from this season is the continuing emergence of Nazaré in Portugal as a big wave hotbed. Virtually unknown as a big wave break until the last six or seven years, the once-sleepy fishing village earned no less than nine nominations this year, including three contenders for the TAG Heuer XXL Biggest Wave Award and two nods for the Biggest Paddle division, more than anywhere else in the surfing world. The WSL Big Wave Awards competition window concluded on March 21, 2017 and spanned the previous 12 months of surfing action. Every wave ridden at every big wave break around the world in this period was eligible for consideration across seven categories. A panel of judges chose the five best rides in each of the categories based on photographic and video evidence. The winners will be crowned at a gala invitation-only awards show at the Pasea Hotel in Huntington Beach, California on April 29, 2017. Viewers around the world are invited to watch the live webcast at worldsurfleague.com and live on the WSL’s Facebook page. The show will also be televised later on the CBS Sports Network in the US. The Billabong Ride of the Year is the top-line category of the event and is awarded to the surfer who demonstrates the most advanced and committed level of big wave surfing during a successful ride, as judged by available video-footage. While raw size is taken into consideration, it is ultimately the level of performance that is rewarded. The category carries the biggest prize of the Big Wave Awards with $75,000 for the winner, $20,000 for second place, $15,00 for third, $10,000 for fourth and $5,000 for fifth place. The first place videographer will receive $6,000, second place will receive $2,500, $2,000 for third place, $1,500 for fourth and $1,000 for fifth. Ben Andrews (Morro Bay, California, USA) at Maverick’s, California on November 9, 2016. Lucas “Chumbo” Chianca (Rio de Janeiro, Brazil) at Nazaré, Portugal on December 22, 2016. Billy Kemper (Haiku, Hawaii, USA) at Jaws, Maui, Hawaii on November 11, 2016. Jamie Mitchell (Currumbin, Queensland, Australia) at Puerto Escondido, Mexico on June 24, 2016. Francisco Porcella (Sardegna, Italy) at Nazaré, Portugal on February 28, 2017. 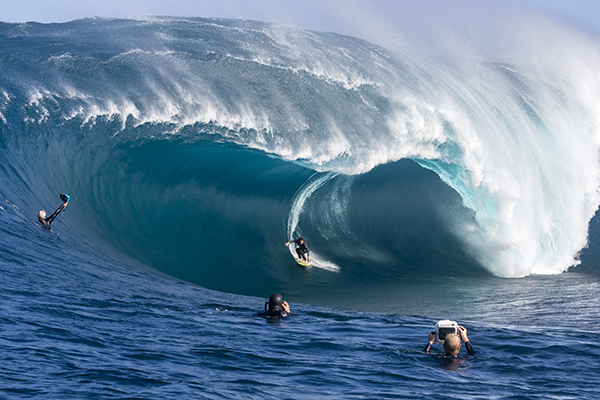 The Paddle Award goes to the surfer who paddles into and successfully rides the biggest wave of the year. The winning surfer will receive $30,000 and the $5,000 will go to the photographer who captured the ride. 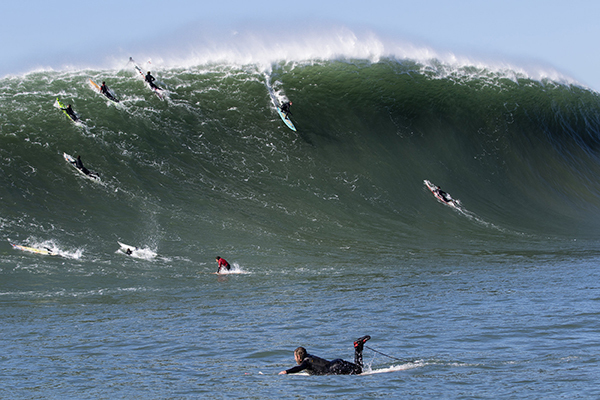 This year’s nominees showcased fearless displays of big wave surfing with rides at Maverick’s and Nazaré. 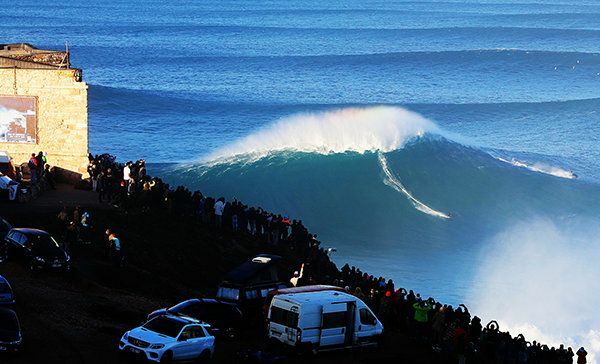 Trevor Sven Carlson (Haleiwa, Hawaii, USA) at Nazaré, Portugal on December 17, 2016. Christopher Mashburn (San Diego, California, USA) at Maverick’s, California on January 26, 2017. Jamie Mitchell (Currumbin, Queensland, Australia) at Nazaré, Portugal on December 20, 2016. San Diego’s Christopher Mashburn at Maverick’s, California on January 26, 2017. The TAG Heuer XXL Biggest Wave Award goes to the surfer who, by any means available, catches and rides the biggest wave of the year and includes four incredible entries from Nazaré and one from Jaws in Maui. The winner will receive a $25,000 prize and the photographer of the ride will receive a $5,000 prize. Trevor Sven Carlson (Haleiwa, Hawaii, USA) at Nazaré, Portugal on December 23, 2016. Kai Lenny (Paia, Hawaii, USA) at Jaws, Maui, Hawaii on November 8, 2016. Francisco Porcella (Sardegna, Italy) at Nazaré, Portugal on October 24, 2016. Sebastian Steudtner (Nuremberg, Germany) at Nazaré, Portugal on October 24, 2016. Hugo Vau (Terceira, Azores, Portugal) at Nazaré, Portugal on October 24, 2016. The performance awards acknowledge the top ten men and top five women over the course of the last 12 months based on every ride captured on video or still images all around the world. Shortlisted surfers include 2016 BWT Champions Grant Baker and Paige Alms as well as big wave heavyweights Greg Long and Keala Kennelly. Since 2016, surfers have been given the opportunity to become seeded on the WSL Big Wave Tour through their placing in the Surfline Best Overall Performance category. This avenue to qualification will be expanded for the coming season, growing from four surfers to six. Photographs and motion pictures of all the Surfline Overall and Women’s Best Performance nominated surfers can be viewed at worldsurfleague.com/bigwave. The Tube of the Year is awarded to the surfer who rides the single most spectacular tubing wave of the year. This award is judged on the impact generated by still photographs. The winner of this category will receive $10,000 and $5,000 will go to the photographer. Dane Gudauskas (San Clemente, California, USA) at Cloudbreak, Fiji on May 23, 2016. Conor Maguire (Bundoran, Ireland) at Mullaghmore Head, Ireland on March 15, 2017. Bradley Norris (Perth, W.A. Australia) at The Right, Western Australia on May 16, 2016. Dan Ryan (Margaret River, W.A. Australia) at The Right, Western Australia on May 16, 2016. Shanan Worrall (Margaret River, W.A. Australia) at The Right, Western Australia on May 16, 2016. Dan Ryan from Margaret River, Western Australia is nominated for this epic tube at The Right on May 16, 2016. While the performance categories salute the most successful rides of the past year, the TAG Heuer Wipeout division presents the most amazing unsuccessful rides for online review. Video of surfing’s greatest aquatic mishaps has become a popular viral staple among surfing fans worldwide, often attracting millions of views and taking its place as a good-natured fixture in the Big Wave Awards. Truly epitomizing the courage needed for big wave surfing, the surfers nominated for this accolade show no shortage of heart and commitment. The winner of this award will receive $5,000 and the videographer who captured the wipeout will receive $2,000. Wilem Banks (Santa Cruz, California, USA) at Maverick’s, California on January 26, 2017. Nathan Florence (Haleiwa, Hawaii, USA) at Maverick’s, California on January 26, 2017. Danny Griffiths (Hobart, Tasmania, Australia) at Shipstern Bluff, Tasmania on June 16, 2016. Tom Lowe (St. Ives, Cornwall, United Kingdom) at Nazaré, Portugal on October 24, 2016. Rafael Tapia (Santiago, Chile) at Nazaré, Portugal on October 24, 2016. A panel of judges will review the nominated rides and the winners will be revealed at the invitation-only Big Wave Awards on Saturday, April 29, 2017 at the Pasea Hotel in Huntington Beach, California. Photographs and video of all the nominated rides can be viewed at worldsurfleague.com/bigwave. To embed nominee video clips directly on your site, please utilize the WSL Big Wave Awards YouTube Channel at YouTube.com/XXL.